Pizza night is pretty much a weekly occurrence at my house. Not only is it simple and affordable to whip up but it’s one of those meals that the whole family can pitch in and help make. My son loves to put all the toppings on. So I let him have at it! It’s a meal we all look forward to. We all grab our slices and a drink, then head to the table for a game of cards. 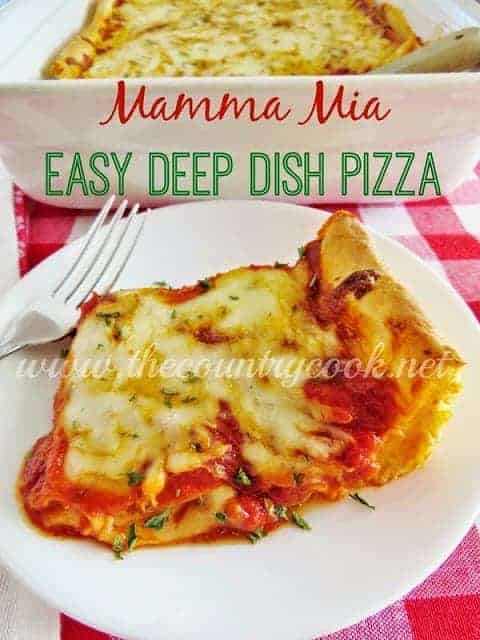 So when the folks at Ragú asked me to create a Deep Dish Pizza recipe using their Ragú® Old World Style® Traditional Sauce, I knew it would be right up my family’s alley. 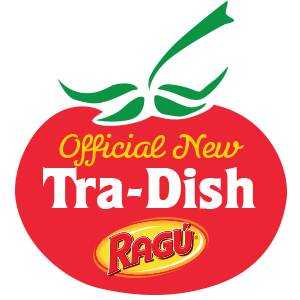 With 11 tomatoes in every jar, Ragú® Old World Style® Traditional Sauce is their richest, thickest recipe ever! But was it thick enough to be pizza sauce? Turns out, it was. We all really loved it and my boys love a lot of sauce on their pizza so it turns out this jar was the perfect size! Note: I had a bag of frozen bread dough that I always have hanging out in my freezer so I just used that as the crust. Works perfectly! I just let the bread thaw and rise (per back of the package instructions). But, most grocery stores these days carry premade pizza dough balls in their refrigerated section. It tastes great and can really cut down on your prep time! I can usually find it in the same refrigerator case where the store keeps their refrigerated pizzas. Preheat oven to 500F degrees. 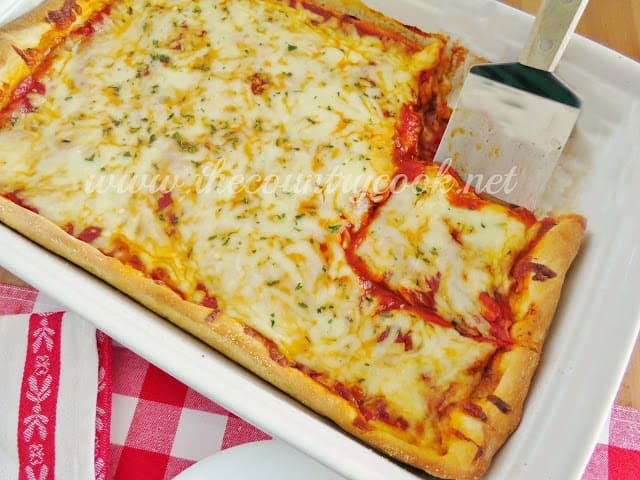 Spray a 9×13 baking dish (or deep dish pizza pan) with nonstick cooking spray. Spread dough into the bottom of the dish and push up the sides. This will take a few minutes because the bread dough springs back some as you stretch it. Sprinkle 2 cups of mozzarella cheese on top of the dough. Then add crumbled sausage and pepperoni on top of the cheese layer. Pour the jar of Ragú® Old World Style® Traditional Sauce on top of the meat layer. *Note: I used the whole jar of sauce because we love a saucy pizza. Please feel free to use as little or as much sauce as your family loves! This thicker sauce worked perfect in this. Then sprinkle with the last 2 cups of the mozzarella cheese. Pop dish into the oven and bake for 5 minutes. Turn the heat down to 400F degrees and bake for an additional 15 minutes (until crust is golden brown). Spray a 9 x 13 baking dish (or 14 x 2 deep dish pizza pan) with nonstick cooking spray. Spread dough into the bottom of the dish and push up the sides. This will take a few minutes because the dough springs back some as you stretch it. Sprinkle 2 cups of mozzarella cheese on top of the dough. Then add crumbled sausage and pepperoni on top of the cheese layer. Use as little or as much sauce as your family loves! Then sprinkle with the last 2 cups of the mozzarella cheese. 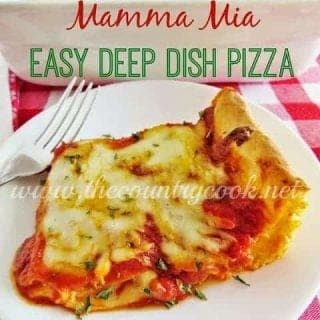 Pop dish into the oven and bake for 20-25 minutes.